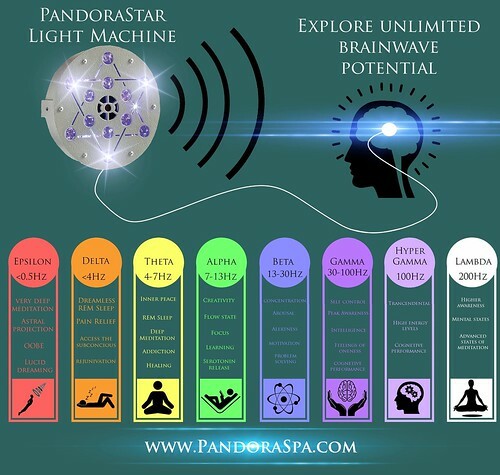 What is the experience witha unique inverted triangle array of LED lights that interlock to create a series of hexagrams, PandoraStar stimulates various brain regions by focusing rays of light on the retinas. 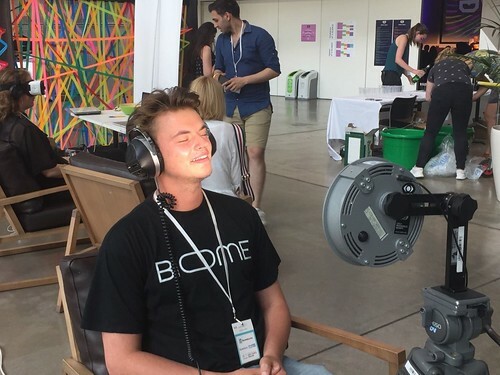 Through closed eyelids, users experience a “visible” frequency entrainment of phenomenal illuminated kaleidoscopes, colours & psychedelic imagery, which provides an immersive environment for deep level brainwave entrainment. What can PandoraStar be used for ? Primarily this is most popular with professionals at any time of the day for creative visualisation & entertainment, it really is a phenomenon that is harder to describe without having the experience, even just a little look inside ! We can help you select from a menu of different programmes to help you experience more relaxation & stress management. We select music without lyrics from Baroque, white noise, nature, to experimental / electronic, psychedelic and even our own compositions ‘Per Diem’ to help immerse you further away from the current moment. For instance if you have a busy schedule and you need to focus hard & fast, you create an inhibitory effect – the pressure sometimes prevents the solution from coming, so thats when its good to ‘shuffle your deck’ ! When deadlines are inhibiting your creative flow and genius – there are programmes for that too – such as ‘Cognitive Enhancement’ & wellbeing. If you are working already on some changes, self esteem, or fitness goals we can aid you with different light settings and speeds to aid Self-hypnosis & personal development. And for the evening sessions I have programmes to tickle your pineal gland, communicate with your intentions to improve recognition of Lucid dreaming & with a longer session guide you into a deep meditation. All sessions are conducted with your eyes closed, but they will not send you to sleep and music is provided to guide each visual programme. These intricate animations are scientifically referred to as Phosphenes and other entoptic motifs :spirals, concentric circles, diffraction patterns. And trust me – I’m an honorary research fellow associated to Greenwich University as artist in residence in the Department of Psychology. I have worked as a Neurofeedback therapist in Holborn for several years and study brainwave changes during these altered states of consciousness. Give guests a magical experience, a cerebral treat they will never forget : seeing with eyes closed the most preternatural colours, patterns, entoptic, dimensions, visions and choreographed light entrained flickering animations. * Guests must read the medical indications on a confidential consent form and sign before they can partake. The main contra-indication to light entrainment is Photo sensitive epilepsy and anti-anxiety medications. Persons who are pregnant or taking certain anti depressants (with a connection to light sensitivity) are also not suitable. 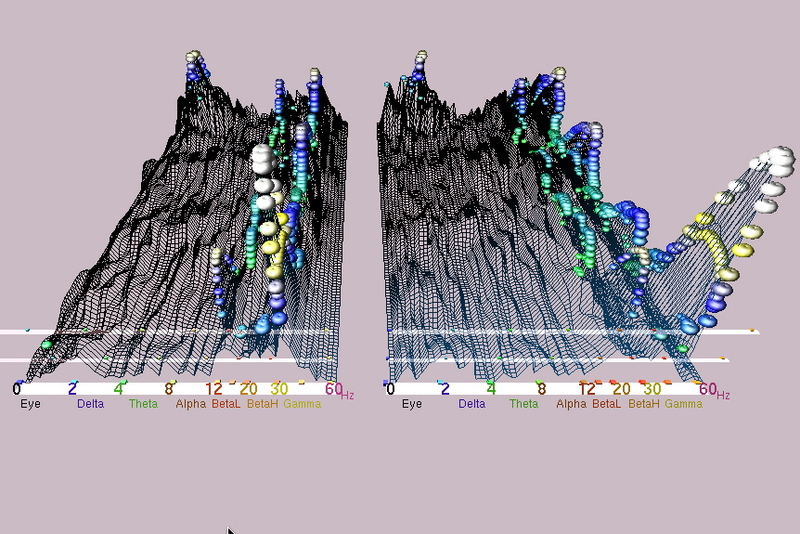 As an additional souvenir of the PandoraStar light entrainment, optional Brainwave recordings can be made from £50 each, the EEG data will be inspected, a short review of changes made written up and the data saved as a Quicktime movie for sharing and posterity. 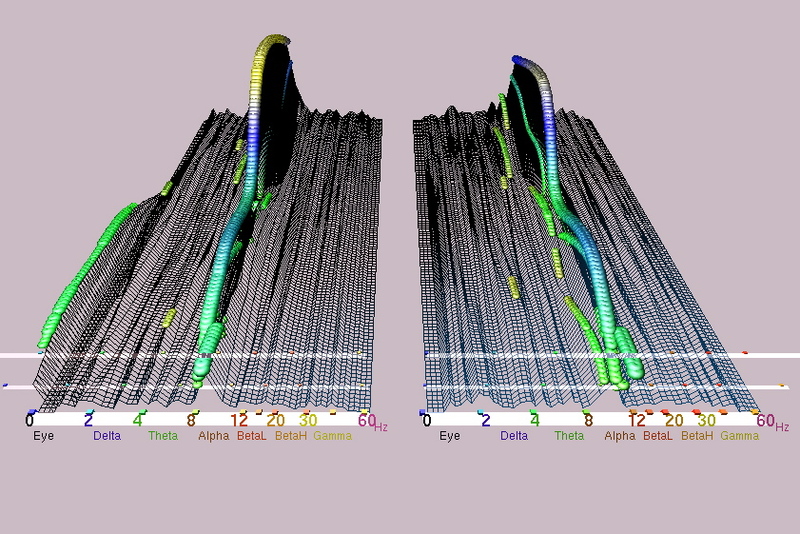 You can see the system used here made by Brainmachine a 2 channel EEG running IBVA5 software to create beautfiul 3D waterfall graphics of the brainwaves over time. Do get in touch if you are need anymore information, I have lots of experience and hope you can try it too.